Russian Ambassador to the United Kingdom, Alexander Yakovenko, about the biggest exhibition of Soviet space artefacts ever seen outside Russia. The exhibition Cosmonauts: Birth of the Space Age was launched last week at the Science Museum in London to universal acclaim. It was a moving experience to see Russian and British cosmonauts and scientists whose names went down in history meet to unveil the largest display of its kind ever to be held in the museum. The British public can see a vast range of items and artefacts (most of which have never been exhibited abroad, and some of which were declassified especially for the event). They tell the story of the space race – which was one of the most epic and thrilling sagas of the 20th century. As the global powers were still reeling from tragedy of the Second World War, they found themselves locked into the Cold War mindset. From the very beginning, space research was destined to become just one of the aspects of this global competition. But suddenly, it became more than that. The thrill of new discoveries and mastering new technologies became the universal drive for scientists, engineers and cosmonauts. Their achievements were seen as crucial steps in mankind’s discovery of the new frontiers. 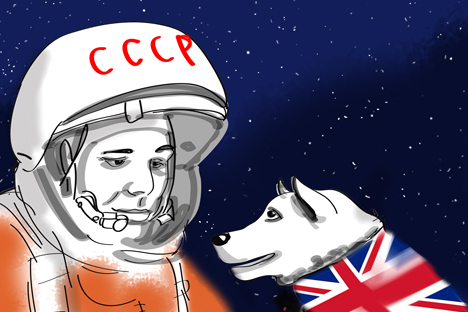 Britain cheerfully greeted Yuri Gagarin – and few were bothered by the fact that he was a communist and a Soviet Air Force pilot. Gagarin was the first man sent into space, and that managed to outweigh all ideological and political considerations. What was destined to be a field of fierce ideological and military confrontation went much further than that, giving birth to a mighty unifying idea, as well as to a whole range of astonishing commercial opportunities. Today, this spectacular exhibition is held against the background of serious political disagreements between Russia and Britain. Even though it is not fuelled by an ideological divide, as was the case in the past, the differing narratives are here to stay. However, this shouldn’t act as an obstacle to cultural exchanges. At the height of East-West confrontation, Moscow theatres staged Shakespeare’s immortal plays and London audiences flocked to the new renditions of Chekhov’s classic works. Moreover, in the 20th century, all thaws in relations between nations have been ushered in by the holding of landmark cultural events – such as the groundbreaking tour of the Kirov Ballet to Britain in 1956. Such events have always been a precursor of convergence at a political level, especially in matters of foreign policy and international affairs, where searching for middle ground and seeking compromise has been a cultural norm for a century. True, culture has a value of its own, but in many ways cultural visionaries define the future more robustly than political leaders. “For a human being there is no other future save that outlined by art,” the Russian poet Joseph Brodsky, who was recently honored with a plaque in Hampstead, said in his Nobel Prize lecture. Culture also has an important role in stopping us sliding into a denial of each other’s humanity. Now, in the absence of political dialogue and intergovernmental co-operation, people-to-people contacts are more important than ever before. A civil forum, like the ones Russia takes part in with other major European nations, seems to be a timely natural vehicle for unofficial bilateral discourse on matters of mutual interest. This is the way we can maintain and build up trust and understanding between our societies. It would be wrong to be at the mercy of adverse political weather. Let people help bring about a change for the better in our overall relationship.